On Friday, a packed room of participants came together in March to learn about identifying and controlling non-native invasive water plants. This was a very good event, judging from the numerous positive responses heard by my colleague Abby and myself, both of us attending this event to up our own skills and to meet a range of stakeholders. 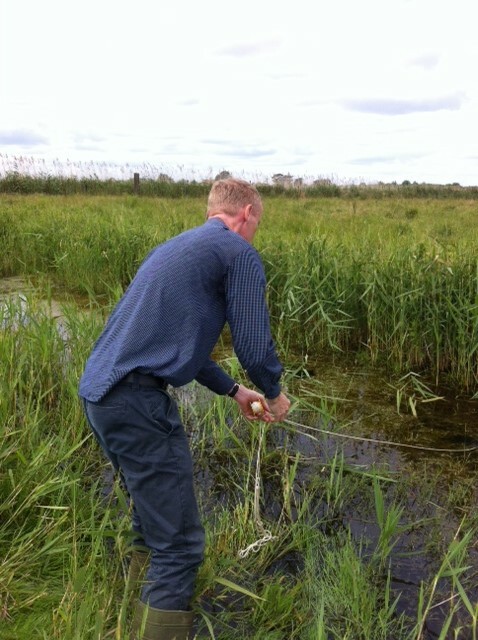 Consultant botanist Jonathan Graham in July 2014 during fieldwork in local ditches near WWT Welney reserve as part of the OWLP’s ‘Ditch Management to the East of the Ouse Washes’ project; using his grappling hook to collect plant samples. Image: Cambridgeshire ACRE for OWLP. 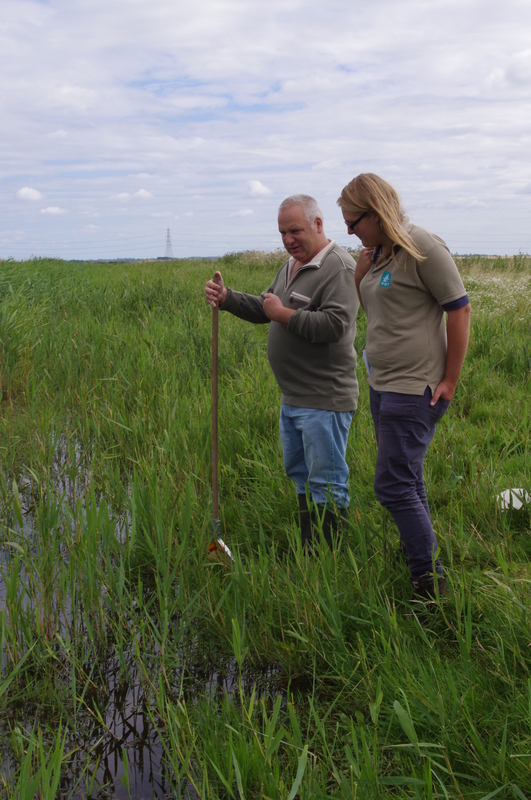 This event was made possible through the Heritage Lottery Fund grant money for one of the 25 projects within the Ouse Washes Landscape Partnership scheme, the ‘Ditch Management to the East of the Ouse Washes’ project. 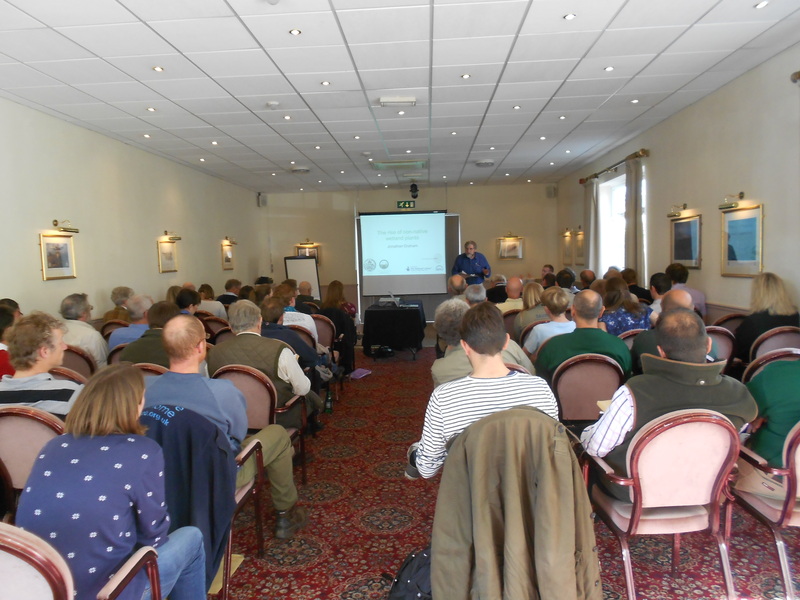 Following successful fieldwork carried out by Jonathan Graham (consultant botanist) and Martin Hammond (consultant aquatic invertebrate specialist), Jonathan Graham, together with Cliff Carson (Environmental Officer, Middle Level Commissioners) delivered this exiting training half-day event. After an introduction about invasive species, and a differentiation between ‘non-native’ and ‘invasive’ species (‘invasives’ being ‘non-natives which have a tendency to spread and pose a threat to the environment and/or human health), we continued with an overview of the mist important invasive water plants to look out for. Packed room during Friday’s event; Cliff Carson, Middle Level Commissioners, setting the scene for the day. Image: Cambridgeshire ACRE for OWLP. With examples on each table of these species, as well as native species with which they could be confused, we then all went to learn to identify these, with the help of several specialists walking around the room (including both speakers as well as Charles Turner, Research Associate Quaternary Palaeoecology, for the Department of Geography at the University of Cambridge). ACE report, ‘Freshwater Biosecurity Plan’, 2014. Jonathan Graham helping with ID of specimens, both native and non-native invasive water plants. Image: Cambridgeshire ACRE for OWLP. 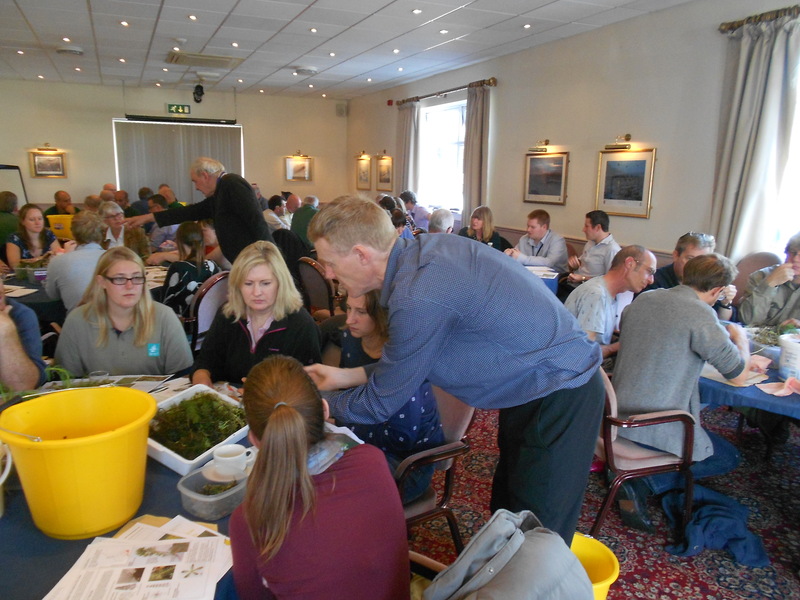 This workshop/ training event was a very practical approach to finding out what is there and how to identify the non-natives; plus guidance how to avoid mis-recording (e.g., some similar-looking rare fen specialist plants that could be confusing). 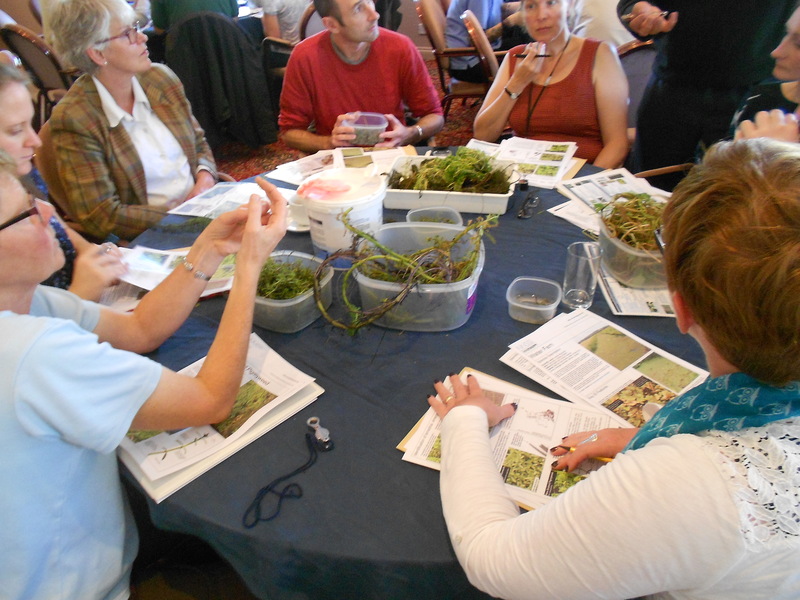 A range of plant specimens and ID guides on each table during last week’s event. Image: Cambridgeshire ACRE for OWLP.